Inspired by the baroque exuberance of Blenheim Palace, the ancestral 'seat' of the Dukes of Marlborough, this custom two seat settee is bench made using a solid hardwood frame, with a loose down wrap seat cushion and down wrap back & arms. The unique lines of the scroll arms, wings, and crown are accentuated with hand applied nail head trim. Nail head trim is standard - offered in brass, antique brass, or polished nickel. Skirt or exposed tapered wooden leg option also available. C.O.M. yardage requirements: 16 yards 54" wide plain goods. (For patterned fabrics, please inquire about additional yardage requirements) Dimensions: 67" lenghth x 32" depth x 56" back height. 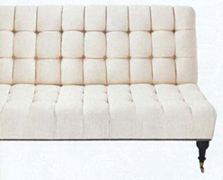 This arm-less settee is named after the 9th Duke of Marlborough, and its deep tufted design harkens back to the plush comforts of The Gilded Age. Featuring thick square tufts, it can work equally well into more contemporary interiors. Crafted using a solid hardwood frame, this piece is entirely hand-tufted over hand tied spring base with down wrap and dacron cushion fill. Nailhead trim option is available, applied at base & sides. Mahogany stained turned hardwood front legs with brass casters standard. Flat tailored skirt option available. C.O.M. 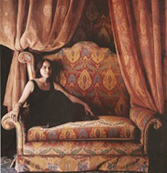 requirement for 48" long settee: 16 yards of 54" wide plain goods (larger quantities required for narrow width & patterned fabrics, and custom order length settees). Standard dimensions: 48" length x 26" depth x 32" back height. Inspired by 'gondole' chairs of the English Regency & French Empire periods, this chair is named for England's most famous military hero The Duke of Wellington. This bench made chair is entirely hand crafted using a solid hardwood frame, with hand tied springs and down wrap over dacron cushion fill. 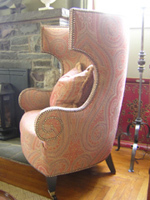 The chair features a deep curved barrel back with square ended wings, and the elaborate scroll motif on the exterior arms is created using hand applied nail head trim which accentuates the lines of the chair throughout. The mahogany finish front tapered wooden legs with brass sabots on caster feet are standard. C.O.M requirements: 14 yards of 54" width plain goods (please inquire for narrow width & patterned fabrics, or leather requirements).